Sir Nicholas Lawless describes the site “...that part of the town and lands of Newtown on the Strand now called Newtown Castlebyrne in the County of Dublin”. The townland is now called Newtown Blackrock, Newtown Avenue, Blackrock. MAP LOCATION Too late for John Rocque’s 1760 map and curiously not named on the 1801 map by Alexander Taylor. Maretimo appears, inter alia, on John Taylor’s map of 1816 and Duncan’s map of 1821 as well as the ordnance survey maps of the late 1830s and forward. Lewis mentions it in his Topographical Dictionary. It is listed in the Tithes Applotments and in Griffith’s valuation. GENERAL Maretimo was demolished in 1970 (some 200 years after it was built) so descriptions rely mainly on secondary sources. Photographs and illustrations show it as red bricked although it was later rendered. It stood two storeys over basement, with a three-bay front aspect. The corniced parapet concealed a pitched roof that covered an attic space. The central projecting front block had a curved Wyatt tripartite window set over an elaborate door. The entrance hall ceiling was designed by Robert West using his trademark bird decorations. The library housed a caryatid mantelpiece and the chinese wallpaper is thought to have predated the house. The (small) demesne extended on both sides of Newtown Avenue and the gardens and house were connected by way of a tunnel. A memorial deed mentioned above notes that it comprised some 10 acres “bounding on the East partly by the sea and partly by John Lees and Thomas Burroughs esqs and Mrs Jones’ holding, on the West by Mr Edmond Burroughs holdings and the high road leading from Dublin to Monkstown, on the north by the sea and Mr Doyle’s holdings and on the South by the King’s high way...”. The walled garden of the demesne was situated within the walls where Newtown Villas are now located and the redbrick walls of the garden can still be seen. In the 1840s the second Lord Cloncurry (Valentine Browne Lawless) provided a site for the Catholic Church of St John the Baptist from the estate as well as the funds to build it. Originally the gardens on the North side of Maretimo ran down to the sea, and the slope of the ground created a hemicycle effect. The building of the Dublin to Kingstown railway in 1834, resisted robustly by Valentine Cloncurry initially, destroyed the uninterrupted access to the coast. As part of the eventual agreement the railway company built, under the direction of Charles Blacker Vignoles, a number of coastal features for Cloncurry. They include twin towers with a foot bridge, a tunnel, a bathing house and pool, and a jetty. John Skipton Mulvany is credited as the architect although some sources suggest that William Cole was responsible for the bridge. In 1868 Lady Elizabeth Cloncurry, wife of the third Lord Cloncurry (Edward Lawless), considered making substantial alterations to Maretimo. The specifications, drawn up by the architect John McCurdy, can be seen in the National Library. Sketches and plans are held by the Irish Architectural Archive in Merrion Square. It is not clear which, if any, of the alterations were made. When the fifth Lord Cloncurry (Frederick Lawless) died at Maretimo in 1929 the title became extinct. His niece the Hon Kathleen Lawless inherited the family fortune. In the early 1930s she sold most of the remaining grounds of Maretimo to the developer Thomas Archer. He created Maretimo Gardens West with its semi-detached houses in an Edwardian style and a single detached house in a Bauhaus style. The first occupants took up residence in 1936. 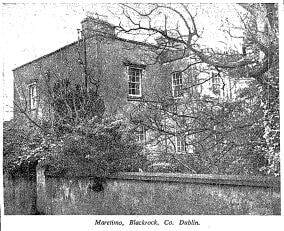 Archer also developed Maretimo Gardens East which included not only Maretimo land but also land that had originally belonged to Blackrock House. ARCHITECT Architects Original architect unknown. Charles Blacker Vignoles associated with the coastal features. Specifications for alterations by John McCurdy in 1868.